Helping keep you and your paws happy, healthy and well informed. ← Did you know it runs in the family? Just the other day my husband asked me, “can you imagine if we had both Dozer and Tank in wheelchairs at the same time?” That’s not a statement said in many homes but if you own Boxers and breeders don’t start to become more conscious of their breeding practices then more people will be saying things like this. My boys were in wheelchairs because of a cruel disease called Degenerative Myelopathy (DM). Canine degenerative myelopathy is a progressive disease of the spinal cord in generally older dogs. The disease has an insidious onset typically between 7 and 14 years of age. It begins with a loss of coordination (ataxia) in the hind limbs. Since April 2012 the mutated gene responsible for DM has been found present in 115 breeds including German Shepherds, Boxers, Wire Fox Terriers, Chesapeake Bay Retrievers, Rhodesian Ridgebacks, and both breeds of Welsh Corgis. The disease is chronic and progressive, and results in paralysis. That’s the technical definition of the disease but if you ask anyone that has shared their life with a DM dog it is a daily heartbreak. Find someone with MS or ALS (Lou Gehrig’s disease) and you will have an insight to the daily struggles. From falling to incontinence, this disease will ravage a dog’s body but keep their mind sharp as a tack. And that’s where the problem lies, you will watch your dog watch himself suffer and there is only so much you can do. Cancer is painful, heart problems happen quickly. With cancer there is pain and suffering and as decent human beings we see changes in our dog’s that warrant the gift of death. Hearts will fail our Boxers instantly and without warning sometimes. DM will force you to look into the soul of your astute canine companion while his body literally gives out all around him, starting from the back and moving forward. You can ease physical pain but it is very difficult to ease constant confusion, fear of falling and wetting their bed when they had no reason to other than they couldn’t help it. What shame these dogs experience. As my journey with my second Boxer boy enters the middle stages of DM I decided it is time to start talking about it. The Yahoo and Facebook support groups provide invaluable advice on how to help you and your dog cope through the phases of the disease, but I want to take it a step further. I don’t want to cope with this disease anymore, I want to stop it! Degenerative Myelopathy in Boxers is genetically traceable (Note: This is not necessarily the case for German Shepherds but many Boxer breeders will use this as one of many excuses for not considering DM in their breeding decisions). The gene was found five years ago and information is being compiled about it daily. What we know now is that Boxers that are symptomatic of DM genetically test to be “at risk”. The disease cannot be diagnosed conclusively without a necropsy so it it suggestively diagnosed based on symptoms. In the Boxer breed no dogs have yet to be found that are symptomatic and carriers of the gene or clear from the gene and presenting symptoms (this is not the case with some German Shepherds). I want to be clear that only “at risk” Boxer dogs have been found to actually have Degenerative Myelopathy. The below chart illustrates what the genetic percentages are of producing “at risk” dogs (those having the double allele of the gene and being at risk to present the disease). So we have the genetic and statistical data to support how to completely eradicate this disease yet we have one more huge battle ahead of us and that is the choices breeders are making. 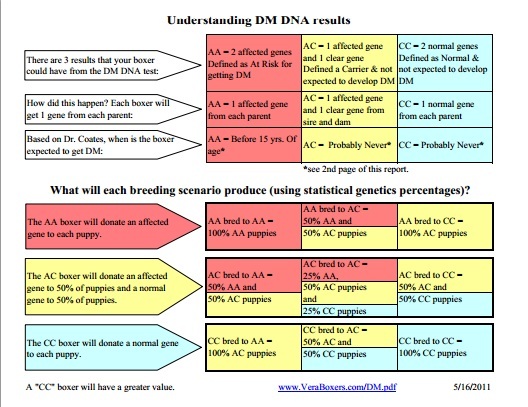 When I found out DM was genetic and avoidable I thought this would be a popular topic that breeders were discussing like they do about finding the gene for ARVC (cardiomyopathy). I couldn’t have been more wrong. Some breeders I contacted hadn’t even heard of the disease. From those that had, not only did I find out DM was a hushed topic, I also found out some breeders would never admit that their dogs had DM; putting them down silently without notifying offspring’s owners. I was shocked! Why in the world would breeders not speak up and be glad that the gene was found so they could prevent future heartaches? It all comes down to perspective of admitting fault. Dr. Joan Coates of the Comparative Neurology Program at the University of Missouri has been leading the study on this canine affliction. She states, “The “A” allele is very common in some breeds. In these breeds, an overly aggressive breeding program to eliminate the dogs testing A/A or A/G might be destructive to the breed as a whole because it would eliminate a large fraction of the high quality dogs that would otherwise contribute desirable qualities to the breed. Nonetheless, DM should be taken seriously. It is a fatal disease with devastating consequences for the dogs and a very heartbreaking experience for the owners who love them. Thus, a realistic approach when considering which dogs to select for breeding would be to consider dogs with the A/A or A/G test result to have a fault, just as a poor top-line or imperfect gait would be considered faults. Dogs that test A/A should be considered to have a worse fault than those that test A/G. Dog breeders could then continue to do what conscientious breeders have always done: make their selections for breeding stock in light of all of the dogs’ good points and all of the dogs’ faults. Using this approach over many generations should substantially reduce the prevalence of DM while continuing to maintain or improve those qualities that have contributed to the various dog breeds”. Instead of sharing this common sense conclusion about Dr. Coates’ study, many breeders choose to focus on the first part of her statement, that an overly aggressive breeding program to eliminate at risk dogs might be destructive to the breed. These breeders claim that a bottle necking of the breed will occur and that we will lose all the other traits that we have come to love. They believe that by working to breed out DM they will be compromising the Boxer standard and decimating the gene pool. Some of these breeders do in fact have “at risk” dogs, and of course some have not experienced DM that have this perspective. Not all dogs that are at risk will develop DM. They can die before they get it from something else like cancer, they can never develop the disease or their owners may not report that their dog had it. Bottom line is that we have inexpensive testing available, and we have a population of 17% clear dogs so why not try just a little to get that number higher? Breeders did it and continue to do it with the the gene found for cardiomyopathy. Why can’t we apply similar energy towards reducing the prevalence and eventually eradicating Degenerative Myelopathy? And that Boxer and dog lovers is exactly my point; we’ve caused these genetic mutations and now have the ability to track them. Why not move them out of the lives of our best friends? For those breeders that are consciously working on breeding out DM as well as other health issues in Boxers, I have compiled a DM Conscious Breeder List. If you would like to be added please email me at cara@getactivepaws.com. The dogs that you breed must have their test results for DM listed on the OFA website. Tagged Boxer breeders, boxer dogs, Boxer rescue, degenerative myelopathy, disabled dogs, DM, dog wheelchair, eddie's wheels, good Boxer breeders, offa, orthopedic foundation for animals, pet health, The Boxer Rescue Inc.
Like Active Paws on Facebook!